IN THE third week of November, in the year 1895, a dense yellow fog settled down upon London. From the Monday to the Thursday I doubt whether it was ever possible from our windows in Baker Street to see the loom of the opposite houses. The first day Holmes had spent in cross-indexing his huge book of references. The second and third had been patiently occupied upon a subject which he had recently made his hobbythe music of the Middle Ages. But when, for the fourth time, after pushing back our chairs from breakfast we saw the greasy, heavy brown swirl still drifting past us and condensing in oily drops upon the window-panes, my comrades impatient and active nature could endure this drab existence no longer. He paced restlessly about our sitting-room in a fever of suppressed energy, biting his nails, tapping the furniture, and chafing against inaction. Nothing of interest in the paper, Watson? he said. It is, indeed! said I heartily. 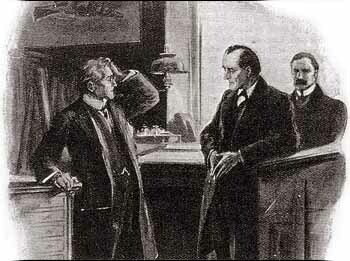 At his heels came our old friend Lestrade, of Scotland Yardthin and austere. The gravity of both their faces foretold some weighty quest. The detective shook hands without a word. Mycroft Holmes struggled out of his overcoat and subsided into an armchair. A blind, said Lestrade, who had sat listening with some impatience to the conversation. It was one of my friends most obvious weaknesses that he was impatient with less alert intelligences than his own. His eager face still wore that expression of intense and high-strung energy, which showed me that some novel and suggestive circumstance had opened up a stimulating line of thought. See the foxhound with hanging ears and drooping tail as it lolls about the kennels, and compare it with the same hound as, with gleaming eyes and straining muscles, it runs upon a breast-high scent such was the change in Holmes since the morning. He was a different man from the limp and lounging figure in the mouse-coloured dressing-gown who had prowled so restlessly only a few hours before round the fog-girt room. And the ticket, too! I cried. Perhaps, said Holmes thoughtfully, perhaps. He relapsed into a silent reverie, which lasted until the slow train drew up at last in Woolwich Station. There he called a cab and drew Mycrofts paper from his pocket. My friends face grew graver still. Come, Watson, said he, our ways lie elsewhere. Our next station must be the office from which the papers were taken. Mr. Sidney Johnson, the senior clerk, met us at the office and received us with that respect which my companions card always commanded. He was a thin, gruff, bespectacled man of middle age, his cheeks haggard, and his hands twitching from the nervous strain to which he had been subjected. Yet we added one more sheaf to our harvest before we left Woolwich Station. The clerk in the ticket office was able to say with confidence that he saw Cadogan Westwhom he knew well by sightupon the Monday night, and that he went to London by the 8:15 to London Bridge. He was alone and took a single third-class ticket. The clerk was struck at the time by his excited and nervous manner. So shaky was he that he could hardly pick up his change, and the clerk had helped him with it. A reference to the timetable showed that the 8:15 was the first train which it was possible for West to take after he had left the lady about 7:30. 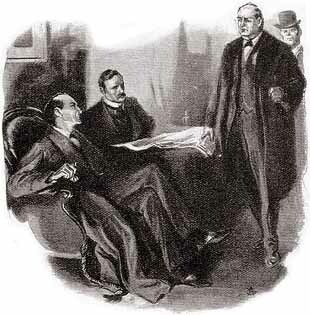 Let us reconstruct, Watson, said Holmes after half an hour of silence. I am not aware that in all our joint researches we have ever had a case which was more difficult to get at. Every fresh advance which we make only reveals a fresh ridge beyond. And yet we have surely made some appreciable progress. Am dining at Goldinis Restaurant, Gloucester Road, Kensington. Please come at once and join me there. Bring with you a jemmy, a dark lantern, a chisel, and a revolver. I knew you would not shrink at the last, said he, and for a moment I saw something in his eyes which was nearer to tenderness than I had ever seen. The next instant he was his masterful, practical self once more. Caulfield Gardens was one of those lines of flat-faced pillared, and porticoed houses which are so prominent a product of the middle Victorian epoch in the West End of London. Next door there appeared to be a childrens party, for the merry buzz of young voices and the clatter of a piano resounded through the night. The fog still hung about and screened us with its friendly shade. 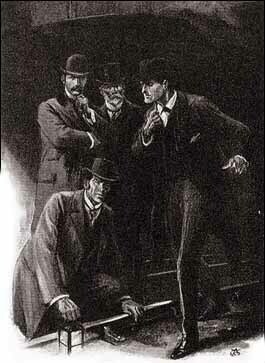 Holmes had lit his lantern and flashed it upon the massive door. Here we are, Watsonthis must be the one. He threw it open, and as he did so there was a low, harsh murmur, growing steadily into a loud roar as a train dashed past us in the darkness. 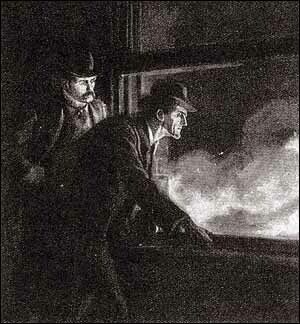 Holmes swept his light along the window-sill. It was thickly coated with soot from the passing engines, but the black surface was blurred and rubbed in places. It was a small tin cash-box which stood upon the writing-desk. Holmes pried it open with his chisel. Several rolls of paper were within, covered with figures and calculations, without any note to show to what they referred. The recurring words, water pressure and pressure to the square inch suggested some possible relation to a submarine. Holmes tossed them all impatiently aside. There only remained an envelope with some small newspaper slips inside it. He shook them out on the table, and at once I saw by his eager face that his hopes had been raised. Hoped to hear sooner. Terms agreed to. Write fully to address given on card. Too complex for description. Must have full report. Stuff awaits you when goods delivered. Matter presses. Must withdraw offer unless contract completed. Make appointment by letter. Will confirm by advertisement. Monday night after nine. Two taps. Only ourselves. Do not be so suspicious. Payment in hard cash when goods delivered. A fairly complete record, Watson! If we could only get at the man at the other end! He sat lost in thought, tapping his fingers on the table. Finally he sprang to his feet. To-night. Same hour. Same place. Two taps. Most vitally important. Your own safety at stake. One of the most remarkable characteristics of Sherlock Holmes was his power of throwing his brain out of action and switching all his thoughts on to lighter things whenever he had convinced himself that he could no longer work to advantage. I remember that during the whole of that memorable day he lost himself in a monograph which he had undertaken upon the Polyphonic Motets of Lassus. For my own part I had none of this power of detachment, and the day, in consequence, appeared to be interminable. The great national importance of the issue, the suspense in high quarters, the direct nature of the experiment which we were tryingall combined to work upon my nerve. It was a relief to me when at last, after a light dinner, we set out upon our expedition. Lestrade and Mycroft met us by appointment at the outside of Gloucester Road Station. The area door of Obersteins house had been left open the night before, and it was necessary for me, as Mycroft Holmes absolutely and indignantly declined to climb the railings, to pass in and open the hall door. By nine oclock we were all seated in the study, waiting patiently for our man. He is coming, said he. There had been a furtive step past the door. Now it returned. We heard a shuffling sound outside, and then two sharp taps with the knocker. Holmes rose, motioning to us to remain seated. The gas in the hall was a mere point of light. He opened the outer door, and then as a dark figure slipped past him he closed and fastened it. This way! we heard him say, and a moment later our man stood before us. 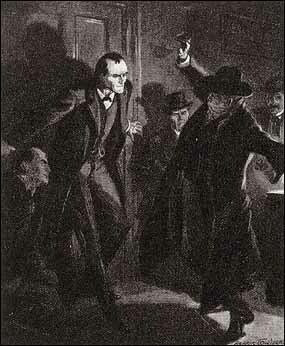 Holmes had followed him closely, and as the man turned with a cry of surprise and alarm he caught him by the collar and threw him back into the room. 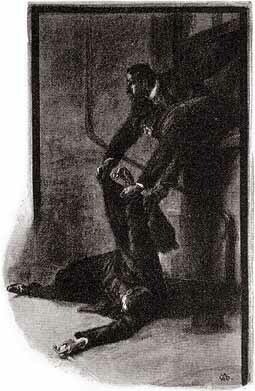 Before our prisoner had recovered his balance the door was shut and Holmes standing with his back against it. The man glared round him, staggered, and fell senseless upon the floor. With the shock, his broad-brimmed hat flew from his head, his cravat slipped down from his lips, and there were the long light beard and the soft, handsome delicate features of Colonel Valentine Walter. Who is he? asked Mycroft eagerly. We had carried the prostrate body to the sofa. Now our prisoner sat up, looked  round him with a horror-stricken face, and passed his hand over his forehead, like one who cannot believe his own senses. I did not! I did not! Before God I swear that I did not! cried our wretched prisoner. Then reparation is still within your power, said Sherlock Holmes. With regard to our transaction, you will no doubt have observed by now that one essential detail is missing. I have a tracing which will make it complete. This has involved me in extra trouble, however, and I must ask you for a further advance of five hundred pounds. I will not trust it to the post, nor will I take anything but gold or notes. I would come to you abroad, but it would excite remark if I left the country at present. Therefore I shall expect to meet you in the smoking-room of the Charing Cross Hotel at noon on Saturday. Remember that only English notes, or gold, will be taken. And it did! It is a matter of historythat secret history of a nation which is often so much more intimate and interesting than its public chronicles that Oberstein, eager to complete the coup of his lifetime, came to the lure and was safely engulfed for fifteen years in a British prison. In his trunk were found the invaluable Bruce-Partington plans, which he had put up for auction in all the naval centres of Europe. Colonel Walter died in prison towards the end of the second year of his sentence. As to Holmes, he returned refreshed to his monograph upon the Polyphonic Motets of Lassus, which has since been printed for private circulation, and is said by experts to be the last word upon the subject. Some weeks afterwards I learned incidentally that my friend spent a day at Windsor, whence he returned with a remarkably fine emerald tie-pin. When I asked him if he had bought it, he answered that it was a present from a certain gracious lady in whose interests he had once been fortunate enough to carry out a small commission. He said no more; but I fancy that I could guess at that ladys august name, and I have little doubt that the emerald pin will forever recall to my friends memory the adventure of the Bruce-Partington plans.